On Christmas Eve, after spending the day with family, we drove by our favorite secret spot for lights on the way home. It's way down the backroads - crazy curves and all. But it's become a tradition each year. After the lights, we sprinkled the reindeer food out in the yard that Pierce had made at school - oats mixed with red glitter, so the reindeer would know we were here. I suspect the chickens appreciated it the next morning too. Turns out Santa really did come! I caught him taking a nap on our couch after setting up the toys! 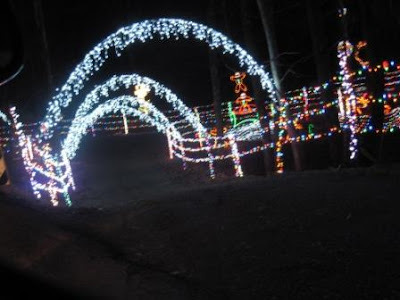 (You can do this with the website www.icaughtsanta.com if you're interested). And the toy that was the biggest hit? The Playdoh Factory. All 3 boys adore it. Indeed, the boys loved everything they received, and the only disappointment at our house was the fact that it didn't snow on Christmas. Pierce is still asking about it. "Mom, but WHYYYYYY didn't it snow on Christmas?!?" Apparently, this is hard to understand when you're five. Hope your families all had a great holiday! And many thanks to our family and friends that helped make this holiday special for us! Be sure to check away my $30 giveaway to Fashion to Figure for an item of your choice here! Love the pic of Santa. Hum, I forgot to ask Santa for a Playdoh Factory myself. Oh, next year! I love the Santa photo effect -- what will they think of next? Oh man...my yonger kiddos would have loved the play-doh factory. Wish I would have thought of that. Now I'm broke and can't even buy the play-doh to go with it! ;) Looks like you guys had a wonderful Christmas! I love the idea of reindeer food! That photo is awesome.. wish the service were available when my kids still believed. That is the prettiest light display I've ever seen! 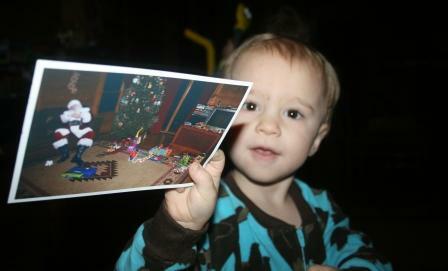 Getting a picture of Santa in your own home is a fantastic idea! Wish I still had little ones. How fun! fun times : ) i need to remember the i caught santa site, what a hoot!! glad the boys had a good Christmas! I love the Santa picture! I bet he needed a nap after unloading all those gifts. Looks like you all had a great Christmas! Love the Santa photo! Looks picture perfect--even without a covering of snow. 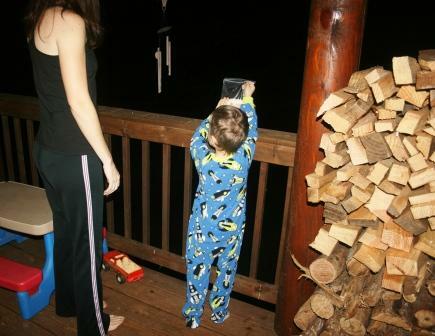 Little kids in footie pajamas always make Christmas perfect. I could tell you horror stories of play doh and carpets... but I won't. Looks like you all had such a great Christmas. Hope your New Year is truly blessed!! Love the Santa photo. Glad to hear you all had a great Christmas. Sounds like an absolutely perfect Christmas! 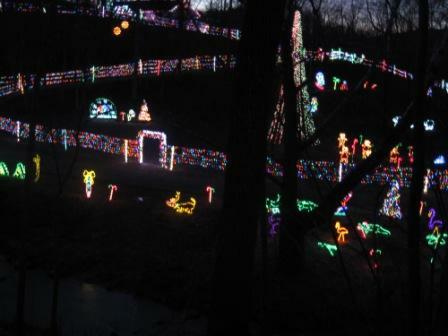 You found a lovely vista for the lights.Love the tree sans ornaments, it gave me a good laugh. Love me some playdoh! I never pass up a chance to play with that stuff! I so love that Santa pic. I will have to do that for the kids next year! Pierce is too adorable!!!! And I love the picture of Santa in your living room, you find the coolest things!!! 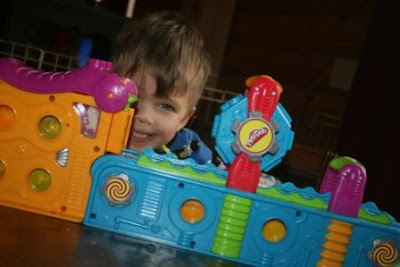 That is a cool Playdoh factory, what a perfect gift for all three boys!! So funny looking at the tree!!! I guess you have given up on it. Do you find ornaments hidden all through the house in January? Beautiful Christmas! Thanks for sharing. ;) Happy new year! It's plain to see the boys had a good Christmas. And they didn't forget to feed the reindeer! Playdough is so messey, but was always a winner with my kids too. I enjoyed playing with it too! That Santa photo is so.. neat. I hope I remember it for next year. These are nice recaps of Christmas but the boys are so cute!! Those lights are awesome! 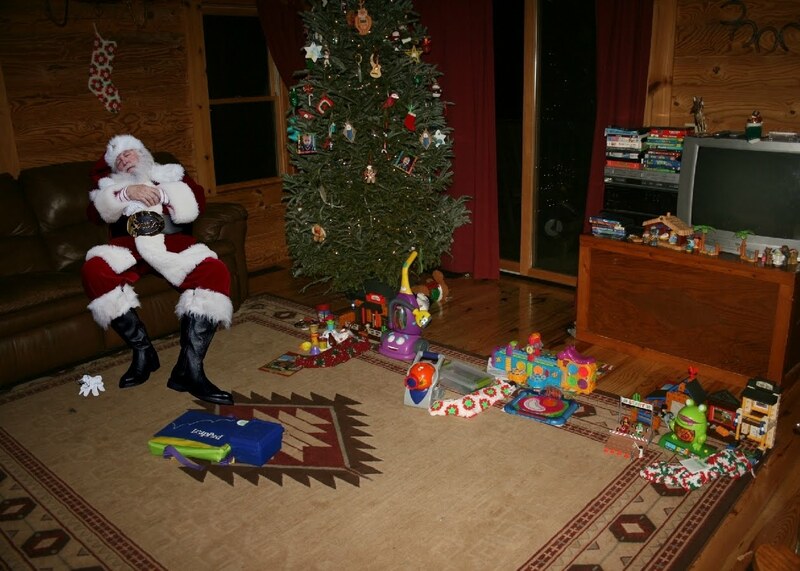 Looks like you had a great Christmas. Hailey got some play doh sets too and loves them. We all played with it Christmas day. I love that pic of Santa napping on the sofa! Wish I had thought of that! Looks like you all had a fantastic holiday!!! Hope you have a wonderful New year! I would have loved to do the photo thing when my kids were little. No doubt about that Santa. Sounds like a really great Christmas. Looks like a great Christmas. I'm going to check that site out. Thanks. 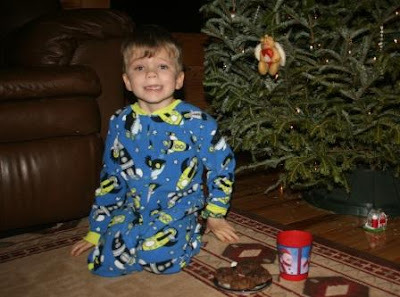 Ahhhh....Santa photo:) I found my son's ipod sitting in the tree branch trying to "capture santa". I should have done this! Oh, I love the Santa picture!! Looks like a fantastic Christmas had by all! Play dough is such fun stuff. And recently we used some playdough, to replace a leg on a little pug ornament. The playdough hardened perfectly. I also remember putting out reindeer food with Amy, and how excited she was Christmas morning when she was sure she saw hoof prints in the snow! I love your traditions! And that photo of Santa is great; Santa's helpers here in Iowa will have to remember that. Your boys are so cute! I love that your leave reindeer food. ! And I just made a picture of Santa at our house and showed my kids the picture on the computer. They were amazed! :) Glad you had a nice Christmas! That is just so cool! My kids would flip if they seen Santa taking a nap at our house. Cute pictures It looks like you had a great Christmas!